Friday is here. Way back machine time! How far back are we going? 1984. I wanted to look at some hard numbers to expound upon my previous post about the Babe Ruth style of investing, to point out how different your investing life looks when you choose to play it safe by selling a successful investment to apply the “you never go broke taking a profit” logic and, say, decide to inventory the profits at a certain point by diverting them to something like an S&P 500 Index Fund. In June 1984, you could have put $10,000 into Disney, by that point the largest media conglomerate on earth. During the 1984 to 1994 period, Disney grew your $10,000 investment at an absurd, life-changing rate of 31% to give $155,000 ten years later. It’s easy to see why someone might have said, “Hey, this can’t go on forever. I had my fun, I improved my wealth 15x in ten years, more than any man has a right to ask for, so I’m going to step to the side and let the S&P 500 take over from here.” What would have happened thereafter? The S&P 500 would have continued to compound your wealth nicely over the next twenty years, turning your $155,000 into $900,000 with dividends invested. Had you stuck it out with Disney and reinvested the dividends? $1.2 Million. Even though Disney’s compounding slowed down, it did not so down so much that it ceased to outperform the S&P 500 thereafter. The price of your self-created insurance cost you $300,000 there. Undue conservatism cost you a vacation home you could have purchased in cash. Becton Dickinson is one of those healthcare companies no one ever talks about because, unlike Johnson & Johnson, it doesn’t have a strong consumer presence that makes its products relatable to the public at large. But yet, among those in the know, it’s a dream holding that has been raising its dividend every single year since 1965. Someone who bought the stock in 1984 would have compounded their wealth at a 18% clip until 1994, at which point an investment in the amount of $10,000 would have become $53,500. Had you handed it off to the S&P 500 in the interest of conservatism at that point? You’d have a little over $300,000. Had you stuck with Becton Dickinson? The compounding monster slowed down from 18% to 14-15%, turning your $53,500 into $869,000. The cost of letting that high-performing holding go? Over half-a-million bucks. The 1984-1994 period was awesome for Conoco shareholders. They got to see their wealth grow to the tune of 16.68%. Carve your head out on the Mt. Rushmore of investors next to Buffett, Munger, Graham, Neff, Yacktman, and Lynch if Conoco has been a big part of your life’s story. For someone investing $10,000, the growth turned your investment into $46,500. If you let the S&P 500 pilot your capital from there, you would have ended up with $280,000. Stuck with Conoco? The compounding rate came down from the 16% range to the 13% range, but you would have ended up with $544,000. Not quite twice as much total wealth by sticking with Conoco. Heck, let’s use the bluest of blue-chip investments, the company that has been compounded at 12% for a century and should be a staple in every conservatively managed account because it has a quality and long-term growth rate that is almost peerless when your measuring period becomes decades. From 1984 to 1994, Johnson & Johnson managed to compound wealth at a rate of 21%, turning a $10,000 investment into over $68,000. It could have been very easy to pause and say, “Well, this can’t continue. Nothing compounds at 21% forever. I’m going to cash out while I can.” Had you made the S&P 500 the quarterback of your portfolio from that point on, you would have ended up with $410,000. Had you stuck it out with Johnson & Johnson? Your compounding rate would have come down to 14%, and yet, your total wealth would have grown to just a hare over $1,000,000. Acting in the alleged interest of conservatism came with a $600,000 price tag, even as Johnson & Johnson continued to acquire billion-dollar brands right under your nose during this holding period. Let’s visit the Old Philip Morris, the tobacco manufacturer that has created wealth in a manner unparalleled in our country’s history, prompting Ben Bernanke to hold 100% of his wealth in the old Philip Morris at one point in his life. From the time Bruce Springsteen released Born In The U.S.A. thirty years ago yesterday until 1994, the old Philip Morris compounded at 24%, turning $10,000 into $88,600. If you concluded that smoking’s long-term fundamentals had become too substantial of a risk to continue holding onto the security at that point forward, the S&P 500 would have turned your $88,600 into $534,000 from there on out. Had you stuck with the old Philip Morris, you would have picked up shares of Kraft, Mondelez, and Philip Morris International. Your compounding rate would have come down from 24% to 18.5%, leaving you with $2.6 million. The price of supposed security in this case came at a price of $2.1 million. 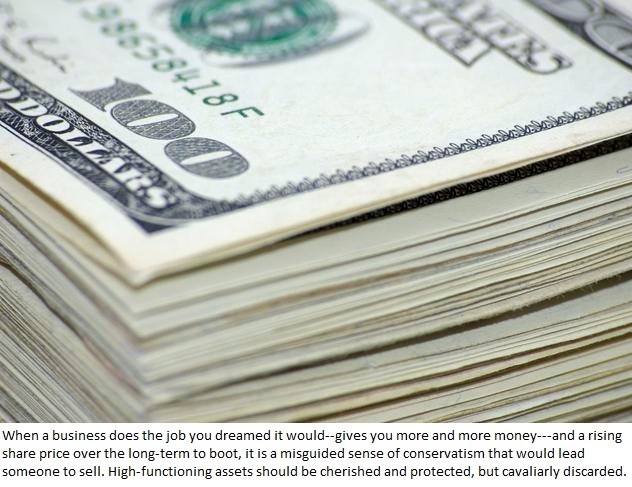 This is why investors that want to reach the next level often speak in terms of accumulating businesses and assets, rather than practicing a strict value investing strategy. If you play gin-rummy with your businesses after they do well, you’re ignoring the possibility that the growth can continue. You’re ignoring the possibility that there is something inherent in the products offered by the business that signals growth above the rate of the S&P 500 for long periods of time. The conventional wisdom is that you should pause once a security reaches a certain percentage of your overall wealth, but often, that could be encouraging you to diworsify. It’s a false security because it can cost you substantial wealth in the long run. Might as well take the dividends from those securities and put them elsewhere. Use your new investing capital to water down its portfolio concentration. And if the high-performing keeps growing in spite of that, you shouldn’t discard something because it’s doing better than what you dreamed it would.